And it’s all about you! That’s right, we’re inviting YOU to be a part of Our Favorite Things Blog Hop Giveaway where you get to take home all the gifts! Scrooges need not apply! I’m so happy Julie of Savvy Eats invited me to take part in this Blog Hop Giveaway. Not only can I offer a token of my appreciation–where would I be without you?–but there are 8 more chances at winning. All you have to do is hop from blog to blog to enter each of the giveaways. And you’re eligible to enter them all–there is no limit here. Spread the joy! Savvy Eats makes dinner so easy! The Little Ferraro Kitchen has you covered for a fabulous night in! Life As A Strawberry‘s set will make your kitchen jobs a breeze! White Lights on Wednesday selected an amazing array of cookbooks! The Marvelous Misadventures of a Foodie has the perfect pizza set! Food Babbles makes it possible for you to be a mad scientist in your own kitchen! Stetted‘s kitchen tools have you covered for just about anything! The Girl in the Little Red Kitchen is making me wish for a cold winter’s night with that cocoa set! I’ll admit, it took me a while to find the perfect gift. I like to select something indulgent–a treat you wouldn’t buy yourself, but you’d enjoy immensely if it just happened to show up on your doorstep. A little bit of extraordinary in an otherwise ordinary life. Something truly amazing. And that’s when it hit me–Jeni’s Splendid Ice Creams! If you’ve never had Jeni’s before, you are missing out! There is only one place I can source Jeni’s locally, seeing as they’re based in Ohio, and as such, there is a limited flavor selection available to me. When I’m feeling super blah, down in the dumps, ain’t nothing gonna bring me up, that’s when I have to have my Jeni’s. It’s the only thing that cures me. Rich, creamy, with the most amazing texture, there is nothing that comes even close to Jeni’s Splendid Ice Creams. And since they’ve brought so much joy to my life, I feel the need to share it with you, as well. It was the right thing to do. 1 winner will receive 6 pints of Jeni’s Splendid Ice Creams delivered right to his/her door for their own personal enjoyment. You don’t have to share–it’s a gift for YOU, after all. And know that I am jealous–I don’t think I’ve ever even had 6 flavors of Jeni’s sharing space in my freezer at any point in time! All you need to do is enter in the Rafflecopter widget below. 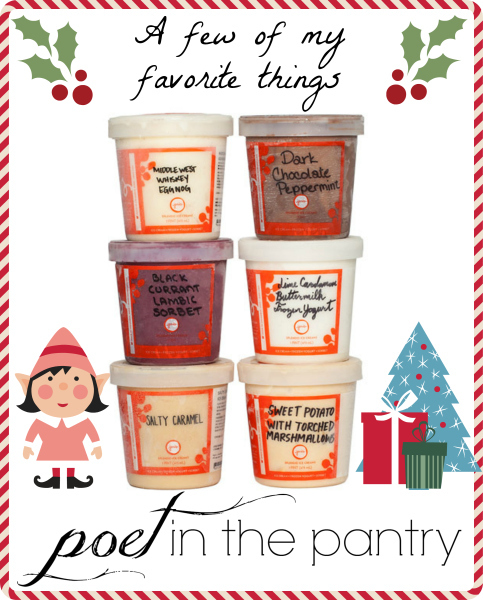 This giveaway is sponsored by Poet in the Pantry. Giveaway is open to residents of the continental United States only. Void where prohibited. Entries must be received by 11:59PM Eastern Time on December 9, 2014, in order to be eligible. Winner will be chosen at random via the Rafflecopter widget and emailed upon completion of the contest period. Winner will have 24 hours to respond before another winner will be chosen. Full giveaway rules can be found here. And don’t forget to check out all the other great giveaways!!!! Good luck! my favorite part about this time of year is seeing my family and spending a lot of time together. I love all the baking, carols and family getting together. It’s my favorite time of the year! My favorite part is built in time off with friends and family! I love the stores decorations. Getting together with friends and family. My favorite part about Christmas is making treats then giving them to family and friends. I just love seeing their reactions! Decorating! I love decorating for Christmas! Considering what I’ve seen of your Halloween celebrations, I’m not surprised! 🙂 I bet it’s absolutely beautiful! I love how happy everyone is – plus I love getting everyone the perfect present! You can’t beat spreading the joy to other people! That’s my favorite part, too! I love the decorations and lights! My favorite part about this time of year is all the holiday gatherings! Jenis is my favorite thing ever! I’m completely obsessed. My favorite thing about this time of year is all the extra gatherings with family and friends. I like cooking for people and having them over. I particularly like to bake for people. At this time of year I have an excuse to have guests any time. Yes! It’s so nice to have people to bake for! making cookies and swapping them with friends. I think my favorite part about this time of year is celebrating the birth of my Lord and Savior, Jesus Christ. I love to celebrate it by sharing His love. I do a lot of baking and then share what I bake with family and friends. I try to do this at times during the year, but living in south central florida it can be very hot and turning on my oven is not the smartest thing to do when it gets really hot. Thanks for sharing your favorite things! I LOVE ice cream. I am originally from Massachusetts where we had lots of dairy farms that made their own ice cream right there on the farm and they were sooooo yummy. I miss that taste of fresh made ice cream. Jeni’s Splendid Ice Cream sounds delicious. Thanks again for sharing!! My favorite thing about this time of year is baking hundreds of Christmas cookies to share! I love that the winter and holiday season gives me a chance to relax — watch a holiday movie, have some tea, wrap a present — and to hang out with friends. My favorite part of the holidays is watching the excitement in my children! They get so excited and filled with joy for the holidays! Kids really change everything about the holidays! It’s so wonderful to see how excited they get! I love it all: the baking, wrapping gifts, cooking, sharing, decorating the tree and the house, laughing with friends, cooking brunch, shopping, etc. I love baking and spending extra time with family. Baking baking and more baking for all those in my life for whom I feel boundless love and appreciation. Oh, and twinkling lights everywhere!!! all of the parties and get togethers with people i dont see too often! I love the way everything smells — Christmas trees, food cooking, candles, etc. Yes! The smells of the season are so comforting! My favorite part of this time of year are all of the twinkly lights. Since it snows 6 months out of the year here, I am all for leaving up pretty lights for most of winter…I think it would make the post-holiday days seem less miserable! Confession: we have a small tree with white lights that we decorate with a snow theme and leave up all winter. Though winter is more like 4 months down here, not 6. Eek! I LOVE baking my great great grandmother’s Christmas Tourtiere, I learned how to make it from my grandmother and my great nieces love it too. I know that I’m carrying on a tradition created hundreds of years ago and it will live on many years after I’m gone. Every Christmas Eve we share the pies at our family gathering and I send one home with each family so they can enjoy it again when they choose! 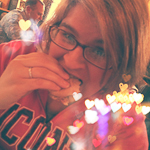 <3 So many good memories surrounding these meat pies! The cold weather and getting to use my oven without turning my whole apartment into a furnace! Going to look at Christmas lights. I love just watching my kids and their excitement. The cookies. ALL. THE. COOKIES. You are a lucky girl! I’d love to visit one of their scoop shops someday! I love buying or making gifts for my friends and family. The fun of making treats for my elderly neighbors and seeing their faces light up! My favorite part of this time of year is spending time with family and decorating. My favorite thing about this time of year is the festive holiday lights I see whenever I take a walk or a drive through my neighborhood! There isn’t much that I don’t LOVE about Christmas! If I have to choose one thing, it would be creating memories and traditions with my 6 year old little girl. It’s so much fun watching her experience everything from baking, to gingerbread house making, etc. The holidays are definitely different when you share them with children and view it all through their eyes! That is far away to be from family! Wonderful that you get to spend time with them during the holidays! I love, love, love decorating for the holidays! My favorite part is baking cookies and decorating. OMG Jennie’s! Did you know there are also ice cream sandwiches? Oh divine! My favorite part of the year are the decorations. Driving around at night and seeing all the lights and displays. It brings light to the dark and is welcome! I did! I can’t get them here, though–I’d have to order them. Thank goodness for shipments! Decorating, baking and enjoying get togethers with friends and family. Best part of this time of the year is spending time with my husband. My favorite thing about this time of year is seeing family and friends that I haven’t seen in a while. I love all the cookies! the cooler weather because normally in Houstom, it is hot and humid! I love the feeling of excitement in the air! Spending lots of time with family and friends -talking, laughing, cooking, crafting. Favorite thing at this time of year is all the delicious parties to go to. MY FAVORITE THINGS ARE HOLIDAY MUSIC. “DECKING THE HALLS”. MY FAVORITE TREATS SEE’S CANDY. HOMEMADE BLACK WALNUT FUDGE. HOMEMADE HARVEST LOAF CAKE, PUMPKIN COOKIES, SOFT GINGERBREAD COOKIES & SNOWBALL COOKIES. My favorite thing to do is baking and spending time with the family…especially my kids. Thanks for the giveaway. Merry Christmas! Definitely the lights. It makes everything look sweeter and vibrant, and fills me with light too. I agree! I’m terrible… I actually leave icicle lights up in my living room windows year-round for whenever I need that little touch of warmth. I love spending time with my adult children. Getting together with friends and family…..and being able to feed them delicious baked goods! My favorite thing about this time of the year is baking items that I only bake once a year. My favorite thing is the opportunity to get cozy with hot cocoa, a warm blanket and a good book. My favorite thing is sitting by the fireplace and enjoying just some quiet time with my husband and cats. It’s how I recharge and don’t let myself get consumed by this very busy time of year. unplug and just soak it all in. I love the Christmas music and decorations! i love snow, sledding, parties and cocoa! Snow days (if we ever have any!) and decorating the Christmas tree! I love the weekend my whole extended family gets together and spends an entire day making tamales. Yum! I love all the family time, the music and singing, and of course the delicious food we don’t have any other time of year! My fave part of this time of year is getting together with friends & family that we don’t see much of throughout the year. And I also love the holiday desserts – including ice cream!! Spending time with family, festive decorations and songs, and baking!! I love the Christmas decorations..the lights, etc! My favorite thing about the holidays is getting together with family and all the great food! My favorite part about this time of year is spending time with my children and grandchildren! My favorite part of this time of year is that everyone is home more often, so I get to cook warm & fuzzy food! Well, the food isn’t fuzzy, but it makes you feel that way! I love the flavors of the season, pumpkin, cranberry & earth root veg. Family time and great food are my favorites. I think my favorite thing is baking cookies with the kids. Lots of excuses to bake! the decor, getting to spend time with family,etc. I love spending time with my family and the festivity in the air, also I love the smell of Christmas trees. My favorite thing about this time of year is all the good cheer that the Holidays bring, it even makes normally grumpy people a little happier. I love Christmas Cookies. More Cookies. More Better. I love eating them and giving them as gifts. Thank you for the generous giveaway offer! I love checking out all the Christmas light displays. Baking holiday treats for family and friends. baking and the holiday sales! my favorite thing about this time of year are cookies!!!! My favorite thing about this time of year is getting together with family and friends. My favorite part of this time of year is snuggling up under blankets in front of a fire. The part when it is all over. I love the gathering of family and friends over good food. My favorite part of this time of year is giving gifts and making gifts and treats for people! I love all of the cooking and baking for parties and family events. Reading “The Christmas Mystery” by Jostein Gaarder with my 15 yo daughter. We started doing it back when she was 7yo and she still looks forward to it. The chapters are arranged by date starting December 1 and ending December 24. There are parts in the story where I’ve always paused..and she fills in a phrase that continues throughout, “To Bethlehem, to Bethlehem!” and we giggle. I can picture her doing the same someday with her children. My favorite part is celebrating the Birth of Jesus! God bless you and yours! My favorite part of this year is really getting time to spend with all family. Baking and spending time with family. My favorite part is baking while it snows outside! Normally I would say the time off from work but I’ll be working during the holiday break this year. I love giving gifts to family members, especially small little creative funny things. Celebrations with family and friends. the baking and spending time with the fam! My favorite part of this time of year is decorating my house and trying new recipes! Not bad at all! That’s one of my favorite parts, too! The look of hope in random peoples eyes, that leads me to believe it’s all gonna be ok. I love the Christmas baking and all of the anticipation over the holidays. My favorite thing about this time of year is how most people seem to be nicer and more courteous. My favorite part of this time of the year is the music and spending time with family. My favorite time of the year is spending time with family! Besides my birthday 😉 Definitely all the quality time with family and friends, especially the ones I don’t get to see very often the rest of the year. My favorite part of this time of year is watching the excitement build in my children as it gets closer to Christmas. The ice cream looks soooooooo yummie! My favorite part about this time of the year is spending time with my family and the laughter we share! 10 more hours and it’s mine! This time of year I love the sounds (Christmas Carols), sights (Christmas decorations) and scents (Christmas trees and homemade treats). Getting together with family and friends. Watching the kids eyes light up in excitement. This would be amazing. My husband would absolutely adore this. My fave part about this time of year is just the ambiance of everything. Just seems tranquil to me. My favorite part of this time of year is spending time with family that I don’t get to see too often. I love the way the world looks when it is covered in freshly-fallen snow.